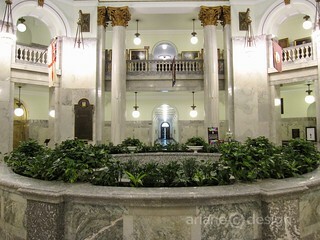 A 10 minute walk from my hotel brought me to Alberta’s Legislature Building. 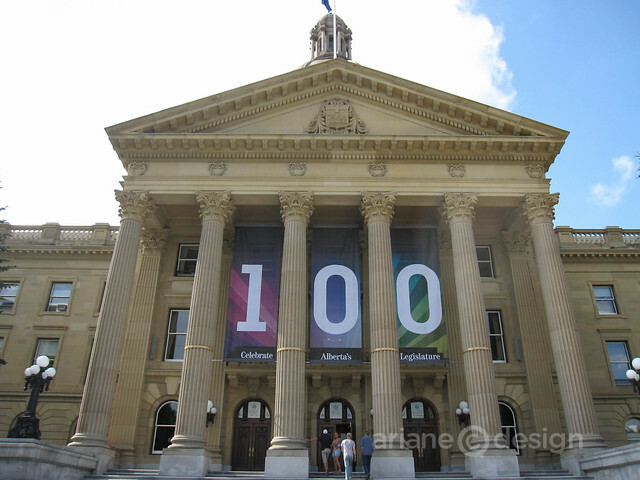 The Legislature forms Alberta’s political heartbeat and this year celebrates its centennial. 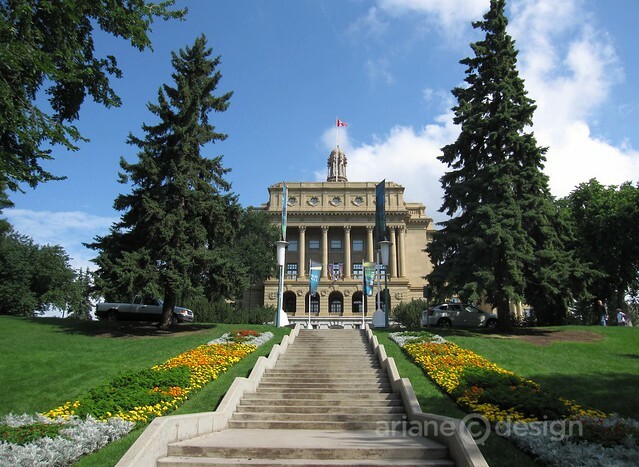 The building is located on expansive and beautifully groomed grounds that reach out to the North Saskatchewan River and valley park. 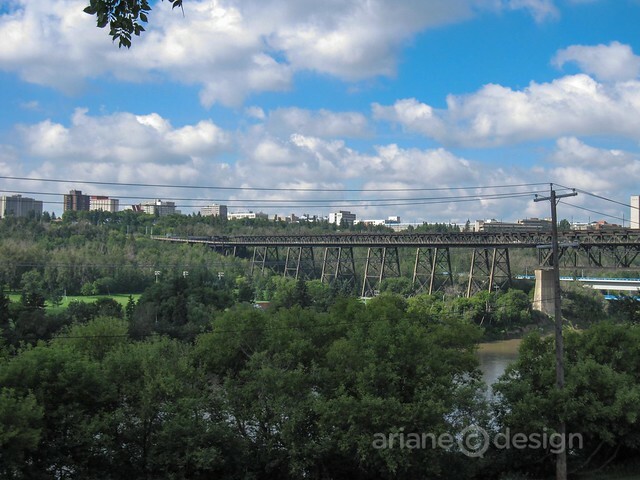 The river valley forms North America’s longest expanse of parkland (7,400 hectares). Compare that to 22 times the size of New York’s Central Park. The government maintains 160 kilometres of multi use trails for walking, cross-country skiing, cycling and segwaying. 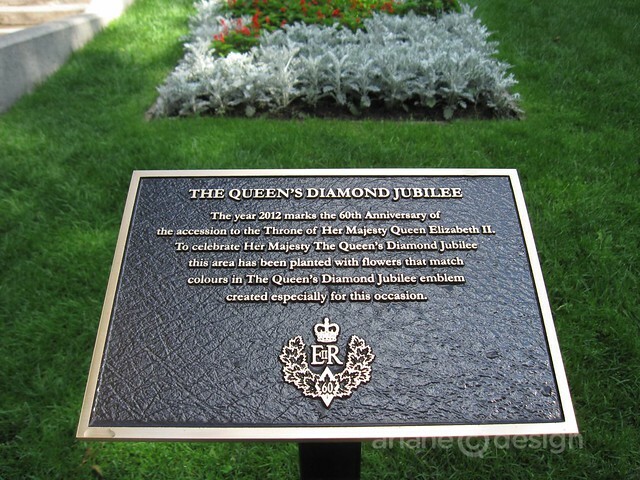 This area was originally used as an important meeting and seasonal dwelling place for aboriginal peoples dating back at least 7,000 years (based on archaeological findings). 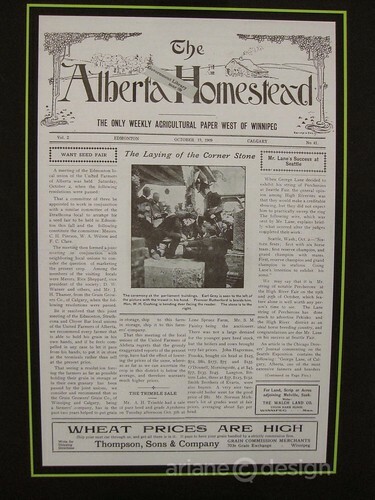 This is where I also discovered the popularity of fountains in a land-locked province. 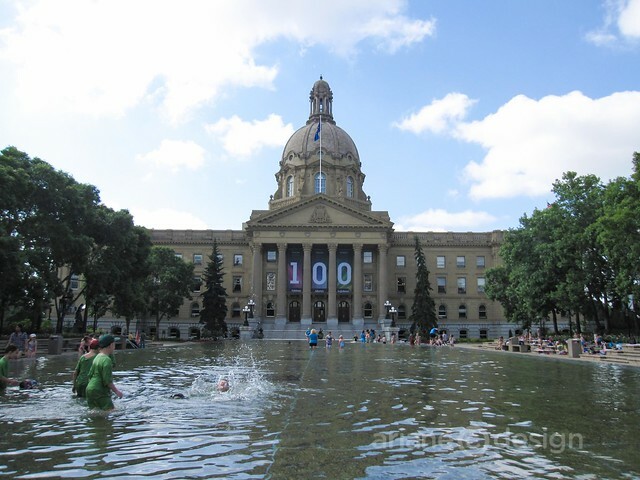 The morning of my visit, groups of kids were out with their parents, jumping in and out of the large fountain outside the capital, for a cool splash of entertainment. 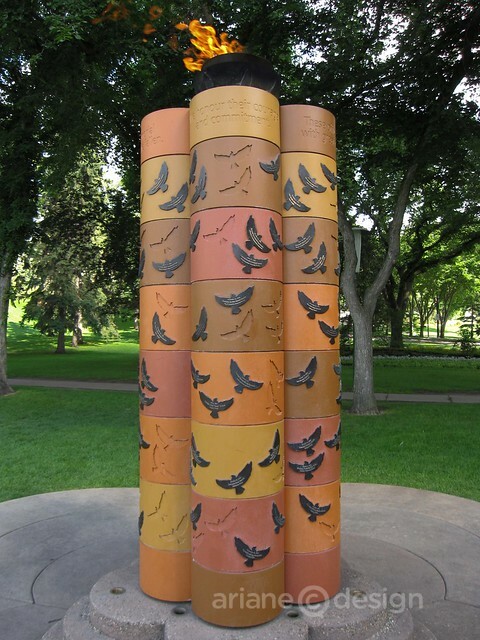 I later saw the same repeated at City Hall’s fountain. A volunteer guide invited me to dip my feet in at the end of my visit. In winter, a skating rink is lit nearby for the enjoyment of all. 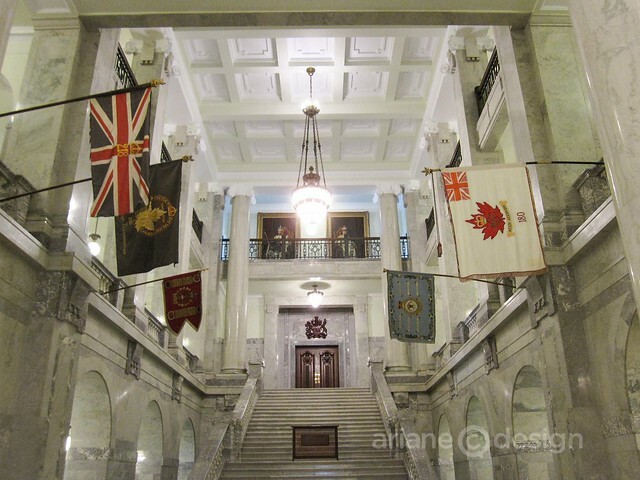 Alberta was formed in 1906, and at this time the province purchased the land here (then known as Fort Edmonton) to create a new provincial Legislature Building. 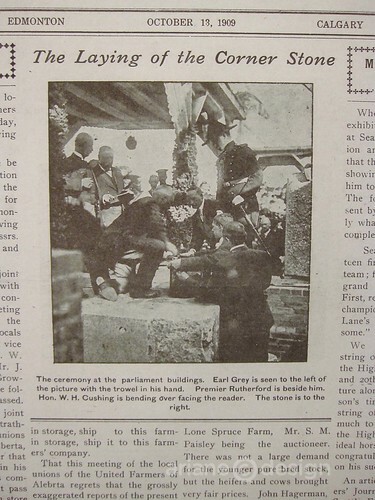 Construction was completed in 1912. 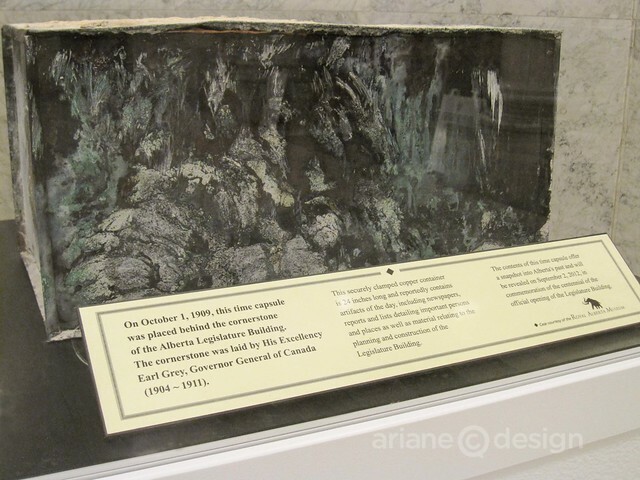 Inside the building is a secure copper time capsule that was placed behind the building’s cornerstone, laid by Earl Grey, then-Governor General of Canada. 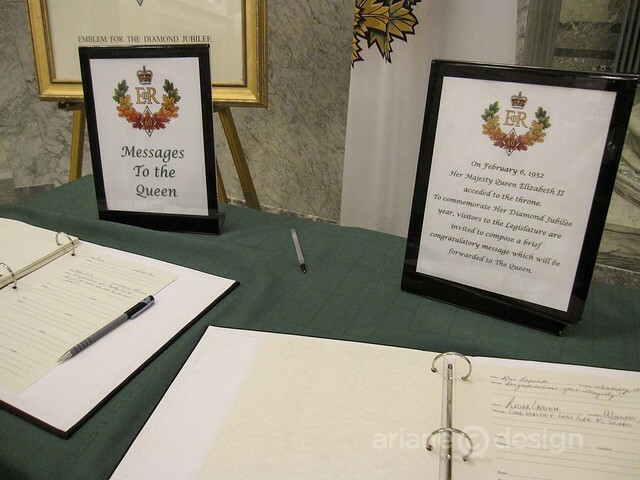 To commemorate the 100 year milestone, that very time capsule will be revealed on September 2 in a ceremony to mark the building’s official opening. 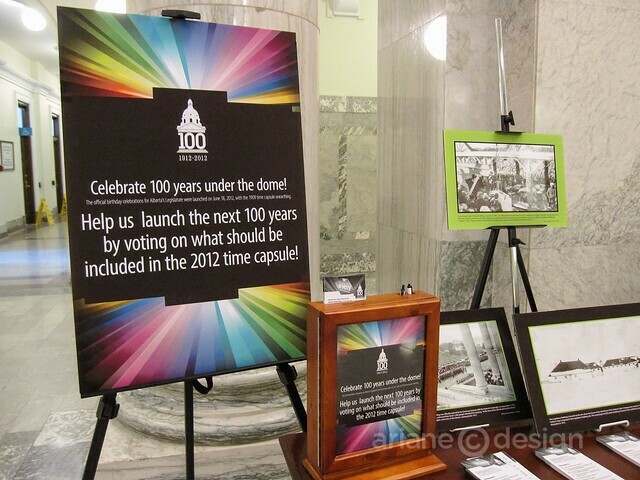 If you visit the Legislature, you can help decide what will go into the 2012 time capsule that will be unearthed in another 100 years! 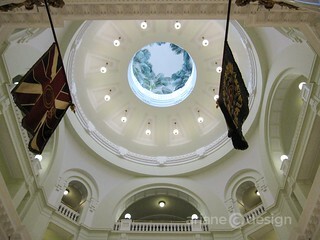 I noticed a lot of commemorative monuments while walking on the building grounds. 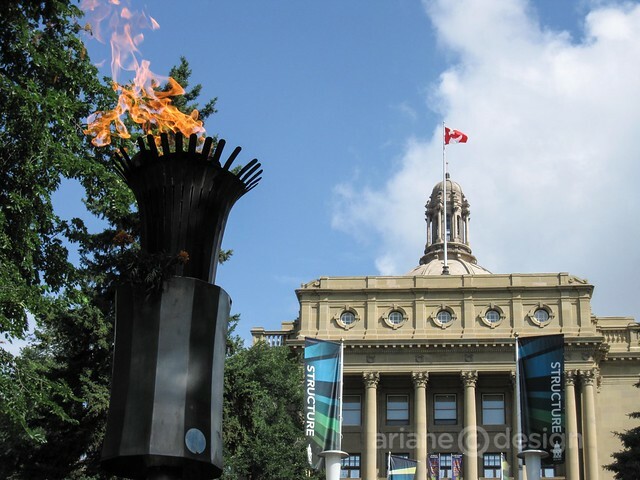 A Holocaust Memorial (2003), Francophone Monument (1955), and Police and Peace Officers’ Memorial (2006) are a few of the over 15 dedication markers, sculptures, and flames that both honour and remember important people and events in history. A small gift shop and interpretive centre is located at the north end of the park. If I return here, I will plan on relaxing on the grass with a picnic. The grounds are that welcoming and peaceful. 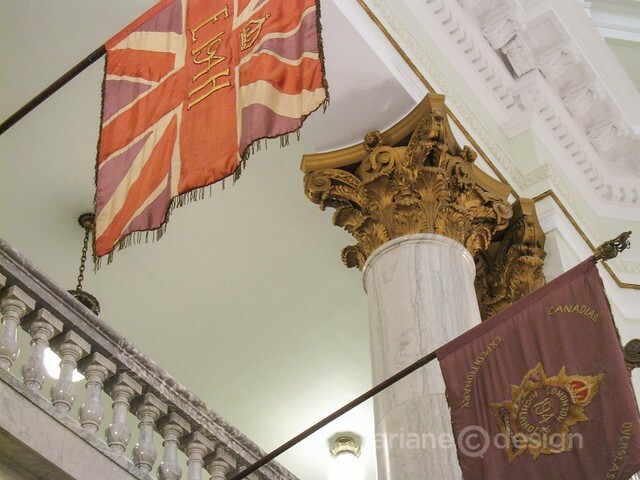 Guided tours are offered weekdays and weekends on the half hour from 9 am to noon, and on the half hour from 12:30 to 4 pm from May 1 to October 15. Outside those dates, it’s weekdays on the hour from 9 am to 3 pm, and weekends on the hour from noon to 4 pm. The tours begin at the gift shop and interpretive centre mentioned above. 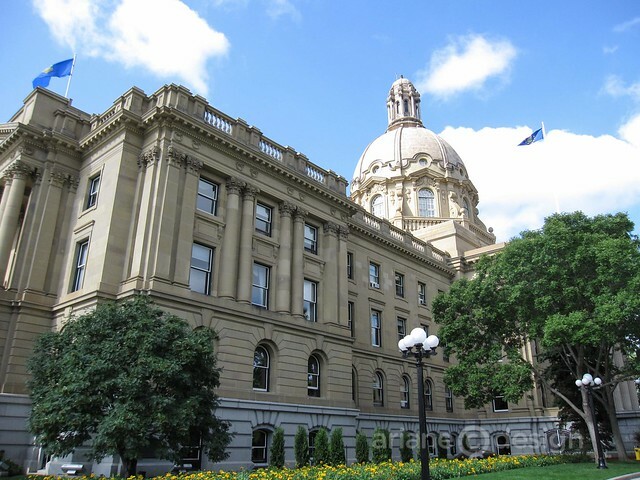 The Alberta Legislature Building is located at 107 Street and 98 Avenue in Edmonton.